After the release of incredible debut single “Veronica’s Veil,” Fan Death return with EP A Coin for The Well, laying down a disco pop marker of things to come from this brilliant duo. “Veronica’s Veil” was released through Erol Alkan’s Phantasy label, and set off an A&R whirlwind. Having signed to the Pharmacy Recording Company, a new imprint of Universal Records, Dandi and Marta toured with Florence And The Machine in the UK, before disappearing to start work on what would become their debut album. For now, they are releasing the first fruits of their recording: A Coin For The Well. Recorded with producer Eric Broucek of DFA at their Plantain Studios in New York. A Coin For The Well is but the first taste of what they have created. If “Veronica’s Veil” harked back to the golden age of disco, then A Coin For The Well moves things forward, adding elements from the heyday of synth pop as influenced by such artists as the Pet Shop Boys, the Human League and Soft Cell. The vocals are classic disco, all icy cool and detached, but they’re never soulless. “Reunited” is a colder affair still, more brooding next to “Cannibal”’s left field disco pop. 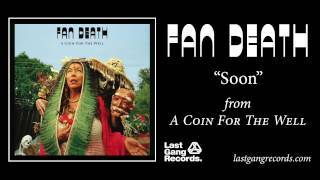 Fan Death have created their own world, a rich tapestry of music, art, fashion and fantasy, creating a sound and look that is totally original. Glamorous and dramatic, fantastical and escapist, Fan Death are one of a kind. Their fevered imaginations taking them in musical directions no one else can replicate. Along with the music, the visual side is just as important. Influences as far and wide as Labyrinth and the Neverending Story, Jodorowsky and Fellini. Their sound is constructed for all corners of the galaxy for a deeply rich listening experience. “Cannibal” has its roots in the disco of “Veronica’s Veil.” The lead track off the EP, driven by a brilliant string motif, is a hook-filled dance floor hit that is a pure pop classic in the making. “Reunited” is darker, and fleshes out the Fan Death musical world further. It comes alongside an incredible video featuring guests such as Marilyn Manson, Billy Corgan, Prince, Axel Rose, Adam Ant, Brian Eno, Siouxsie Sioux and more. Look out for it. “Power Surge” is a clattering string-laden affair, whilst “Soon” shows off a slowed down side of the Fan Death coin, whilst “Son Will Rise” rounds the EP off with a head rush of a final track.